Enjoy a traditional Afternoon Tea in Yorkshire! In the early 19th century, the upper class sipped their tea according to strict social schedule. Between a day filled with parties, picnics, and polo it was custom to enjoy Afternoon Tea to socialize and snack before dinner. While the British elite enjoyed their tea between mouthfuls of conversation, the working class marched to a different schedule and budget. Tea was still expensive at the time and factory workers could not waste money on clotted cream. Thus High Tea evolved, and from it came hearty meals featuring bread, vegetables, cheese, and of course, tea. Traditionally, Afternoon Tea is served around 4 pm. It was not created to replace dinner but rather to fill the gap between an early lunch and a late dinner. Small sandwiches, scones, biscuits, and tea were typically on small ornamental three-tier serving trays. Now, Afternoon Tea is seen as a treat, saved for holidays and special occasions. In Yorkshire, the famous Bettys Tea Rooms have continued to uphold the standard since their doors opened in 1919. 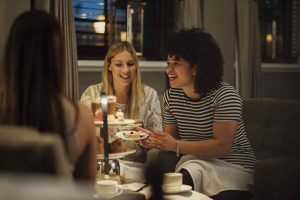 Travelers and locals alike flock to Bettys for delightful finger foods, sparkling wine, and warm tea. Typically served after the end of a long workday, 5 pm or 6 pm, High Tea traditionally consisted of a meat dish, crumpets, potatoes, onion cakes, baked beans, or cheesy casseroles. While Afternoon Tea was largely seen as a social event, High Tea was a substantial meal for the British working class during the 18th and 19th centuries. High Tea has been commonly associated with northern areas of England and Scotland. Today, you can enjoy a traditional High Tea in either lovely country! AESU offers several trips to London and the UK, including Cosmopolitan, Euro Spree, Explorer, Euro Focus, and our most popular tour, Great Escape. Explore England and its rich history and culture. Stroll through London, the muggle capital of the world – be sure to watch out for the Knight Bus! This entry was posted on Wednesday, May 31st, 2017	at 2:20 pm	. You can follow any responses to this entry through the RSS 2.0	feed. Both comments and pings are currently closed.